The old Baltimore Catechism No. 1 in 1891 had the first few questions in each of 37 lessons of three Catechisms that also had 37 lessons. The first version was published in 1885. Much later in the 1940s the BC No. 0 was divided for First Communion as published by the Confraternity for Christian Doctrine (CCD). It was intended to use with young children preparing for First Communion. This booklet had had the first twenty catechism lessons plus the Ten Commandments and prayers. After that there were many other versions approved by the CCD. It covers the main Catholic beliefs and prayers. It has concise answers that are easy to memorize. The No. 1 is shorter than the No. 2. The No. 2 contains all the No. 1 questions, so if you have the No. 2 you also have the content of the No. 1. In the first ten questions of the No. 2, Questions #7 and #8 are not asked in the first catechism. The numbering is the same but the No. 1 comes from the No. 2 and does not include all of the questions and answers to make it simpler to use with little ones. It does use the same wording, though, so if your younger students are working with your older children, the answers will be the same. Whew! You will not have to "un-teach" a phrase and you can use the two books together because they use the same Q&A numbers. The main difference between most catechisms in a series is that the higher levels include more questions and answers. Sometimes the answers are expanded with more detail. What's nice about the Baltimore No. 1 is that it is brief and concise which makes it easier for children to memorize the answers, even through many versions and publications. If you already own a BC2 you wouldn't need to buy the BC1. The original uses the older versions of the Acts of Faith, Hope and Charity; and it uses the Perfect Act of Contrition. All of the main Catholic prayers are included especially those for saying the Rosary and going to Confession. As with the No. 2 there are devotions and hymns in the back of the booklet. The New Saint Joseph First Communion Catechism published by Catholic Book Publishing Company which is vastly different from the other two. See more on these below. If you purchase a product through links on this page, I receive a small commission at no extra cost to you. My integrity and your satisfaction are very important to me, so I only recommend products I have purchased or would purchase myself and which I believe would benefit you. To learn more please see my affiliates disclosure policy. The CCD licensed the revised edition that is used in Our Holy Faith, Volume 2: Jesus Comes, 1959. 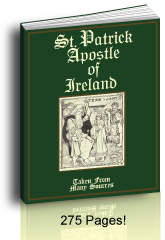 It is the version that St. Anne's Helper uses as it has excellent answers that are specifically geared toward a good preparation for First Confession and First Communion. His life, death and Resurrection. 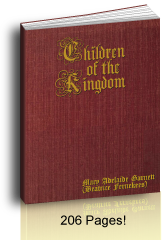 These are interspersed with the Baltimore Catechism questions and answers and it is now available from the new TAN Books company. It is a very nice book and makes a nice reader, too. You can buy it at Amazon here. The St. Anne's Helper First Communion Catechism CDs and worksheets cover most of the answers used in this book. You can buy the audio, ebooklet, and copybooks here. The Living My Religion Series makes a nice Baltimore Catechism set as well as a very nice Catholic reader set. Lepanto Press has republished it and it is used at Our Lady of Victory School (OLVS). The Primer has the first eleven Baltimore questions and answers with super simple sentences that demonstrate God's Love as our Father. Book 1 is called Living in God's Love and includes many of the answers through question number 39. Book 2 is called Living in God's Law and covers many questions from both the No. 1 and the No. 2 of the older version. "Actual Grace is a gift of God that helps us to act right." "Sometimes it is easy to act right. Sometimes it is hard. But, easy or hard, we need grace to act right." "We need actual grace. It helps us to do good acts. It helps to keep away from sin. We need it and God will give it to us." The St. Anne's Helper First Communion Catechism questions and answers cover the first three books of the Living My Religion series that you can buy at OLVS. Most of the prayers and answers match our audio, ebooklet, and copybook digital downloads. The New Saint Joseph First Communion Catechism (NSJ) is currently the version of the Baltimore Catechism No. 1 that many parishes and Catholic home school companies recommend for First Communion. This has been true for more than fifty years. There are differences, so we usually use what the school or diocese is using. Personally, I find that the NSJ is more vague and has some difficult places especially in its many republications that do not note the increasing number of revisions, especially in the beautiful pictures of the First Communion book. In this series, generally, schools use the NSJ No. 1 for the years immediately after First Communion. Another difference is that it uses Bible quotes from the CCD Bible version. For most of the years that our children went to a Catholic elementary school they used the NSJ No. 1 and 2. These did not concur with what they'd studied for First Communion in the old Baltimore Catechism in a few instances, and teachers would mark the answer wrong in class if they used the previously given answer. Not only were the answers marked wrong, but the new answers sometimes caused confusion. This shows why it is so important to start with a good catechism and stay with the same answers through the years. See my explanation of some of the catechism differences here and specifically NSJ changes here. St. Anne's Helper First Communion Catechism uses the Baltimore Catechism No. 1 and is very helpful for learning the basic Catholic beliefs for First Communion and Confirmation. The Audio Catechism CDs and Catechism Copybooks can help reduce the time and effort necessary for children to learn the catechism questions and answers. It uses the prayers and answers taught in the Baltimore Catechism from a later CCD version (Living My Religion and Jesus Comes as above). You want the best answers for First Communion preparation. Well! Here they are. No matter which program you use. You can see the text of the St. Anne's Helper First Communion audio catechism here. The audio CDs or Downloads are especially handy to practice for Religion class, Sunday school, RCIA (yes, adults like them, too), and homeschool. Children can review on their own, while younger children appreciate the patient repetition. Excellent for audio learners. Adults who are studying for the Faith appreciate the benefit of an audio book to be able to review the answers while driving or doing light chores (the FC and the Confirmation CDs cover most of the main questions asked for entering the Church). Parents and children appreciate the benefit of ambient learning and review while riding to and from church, school and errands; or while coloring and doing other craft projects. Catechists, teachers, and homeschooling families appreciate the several formats for teaching and reviewing the prayers and answers. Either way, whether your student is enrolled in a class that uses the Baltimore Catechism No. 1, or not, our St. Anne's Helper Audio CDs and downloads help with the usual catechism prayers and answers necessary for preparing for First Communion. The audio review is helpful for any student, child or adult, but especially for the auditory learner or one who doesn't enjoy reading. 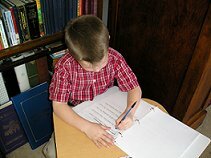 We made up Catechism copybooks for our youngest children so that they would have the penmanship practice they needed and some filler/busywork to keep them busy with constructive material when the older children were studying. 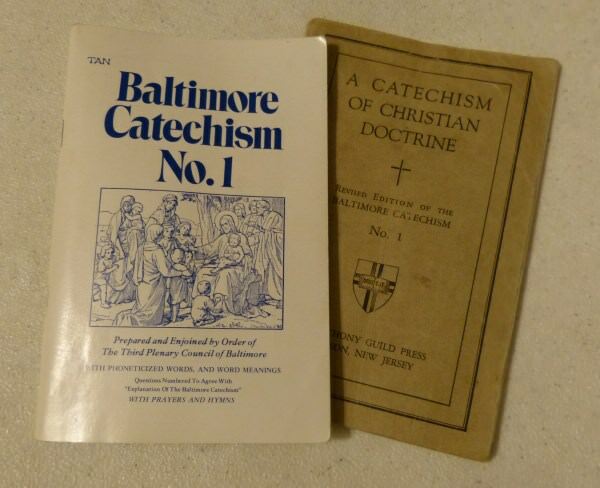 What better Catholic copywork than the Baltimore Catechism No 1? This way the children could practice their handwriting on reprintable sheets that used the same BC questions they were learning for First Communion. This is a God send if your children have to write their catechism answers for a test. We also made certain to find a font that would imitate the "a" that children print, not the one that is generally found in text books that has a flag over the letter. The lower case letter "g" was important, too. Some of our older children have asked if they can use the copybooks, too, they like them so well. (Now this is a magic moment. When a student WANTS to write beautifully he or she then CAN write beautifully!) One big sister wanted to build her own collection in a binder with all three sets tabbed! See the copybooks here. 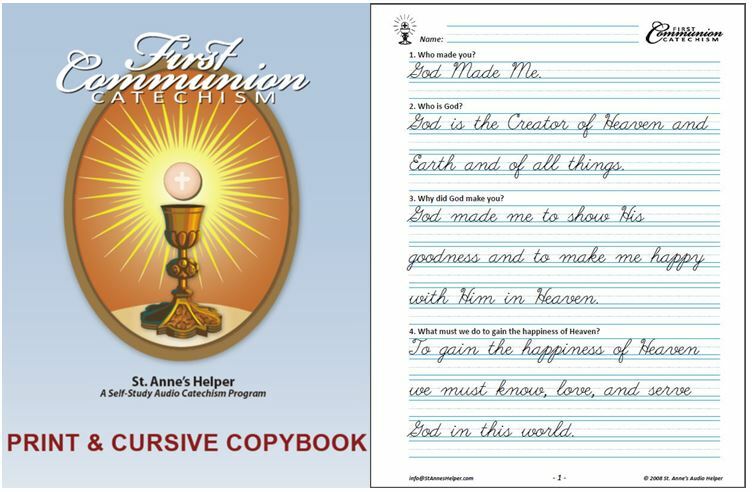 The St. Anne's Helper First Communion Catechism Copybook is reproducible whenever you need it. You can print all the pages and then have them bound at an office supply store or simply keep them in your own binder using pre-drilled 3 hole paper. A folder works well, too, for individual copywork pages. Either way, you always have a Catholic copybook on hand for writing practice! At the end of the year tie the booklets together with ribbons, or, as with our son, zip ties! Blue for him. The text of the First Communion Catechism Copybook matches the text and audio of St. Anne's Audio Catechism CD or the download version of the same enhanced audio CD (both text and audio available on the same CD in a beautiful presentation box). The First Communion Catechism Copybook is available in manuscript writing. 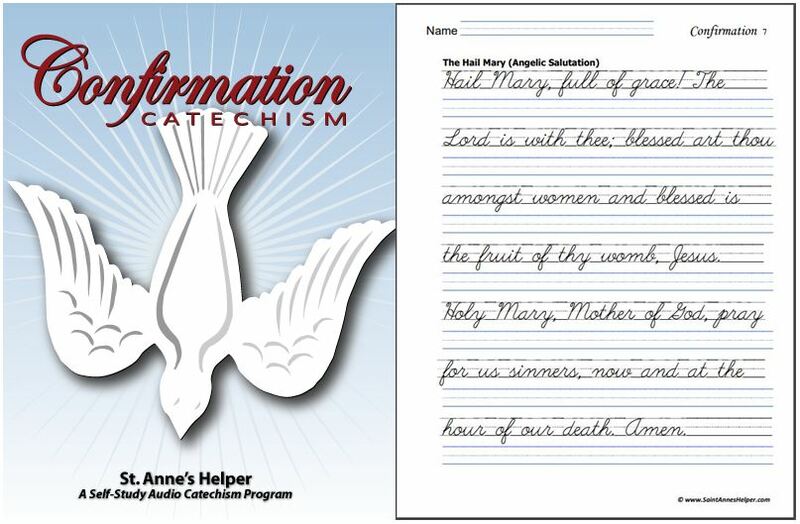 Using St. Anne's Helper reproducible Catechism Copybooks makes the copybook idea one step more convenient! See catechism copybook samples here. We have ebooklets that you can download and print as many times as you need. They are verbatim to our other First Communion downloads and use the old Baltimore Catechism No. 1. They contain the same information with a few formatting extras in a handy booklet to print. 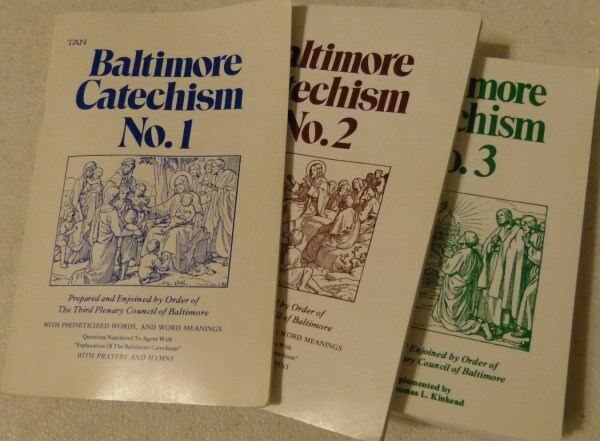 Anyway you choose, you can now have the Baltimore Catechism No. 1 questions and answers that your children need to memorize on Audio Catechism CDs, Downloads and Catechism Copybooks. First Communion Catechism audio clips. Explanations of some of the answers in different catechisms. Buy St. Anne's Helper Audio and Copybook Downloads. 1970s TAN Books Baltimore Catechism No. 1, No. 2, and No. 3.